The voice acting in the original Resident Evil is famously awful, as this torturous 11-minute "Voice Acting Horror" video, courtesy of YouTube user gamegoonie, makes painfully clear. In that light it's hardly surprising that Capcom elected to record a revised script and new cast for the recently-released remake. But there may yet be hope for those of you who, for whatever reason, would prefer to stick with the old cheese. 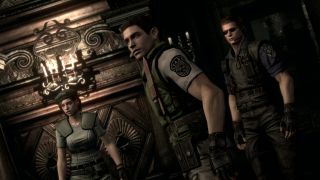 A Resident Evil Modding forum user by the name of Bunny revealed over the weekend that he's working on a mod that will replace the new voices with the "legendary" voice acting from the original. He's got five rooms done so far, and said he's working on finishing as many others as he can. It's a tricky job, as other forum users have pointed out, since there are new scenes that aren't in the original game, and of course not everything is going to match up perfectly. But he's posted a couple of videos of his efforts on YouTube (one of them playing above, the other here), and they are glorious. I'm not sure I'd want to play the whole game like this, but I love the idea that it might be possible.